1 (of a substance) able to be dissolved, esp. in water: the poison is soluble in alcohol. 2 (of a problem) able to be solved. 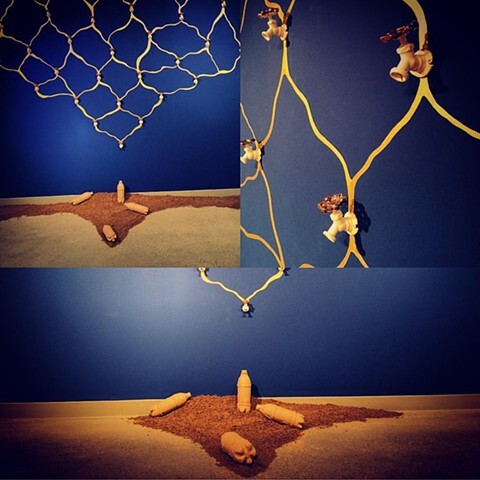 Installation Description: "Soluble" is a woven stream line of water resources, a netting of our connected conversations that "water is gold" as our resources continue to face contamination through our combined actions and efforts. The installation is a response to witnessing an account through social media feeds of the water crisis in both the communities of the Animas River and Flint Michigan where thousands of plastic water bottles were being shipped out daily for drinking water. At the same time reports of the growing plastic island floating in our oceans visually streamed through.